Manila, Philippines - Senate Majority Leader Alan Peter "Companero" S. Cayetano said Vice President Jejomar Binay's negative statements on the credibility of the national government's investigation of the P10-billion pork barrel scam is scaring away possible witnesses, undermining the President's Daang Matuwid and the efforts of the present administration to prosecute those who stole from the Filipino public. Binay, who has already stated his intentions to run for the presidency in 2016, earlier described the testimony of Ruby Tuason as a "dud." He also just recently said the Department of Justice (DOJ) is unfairly subjecting Sens. Juan Ponce-Enrile and Jinggoy Estrada - both allies of the Vice President - to a trial by publicity. Cayetano described Binay's statements as ominously revealing, as it may tend to discourage more witnesses in the pork barrel scam investigation to come out and turn state witness. He said that if Binay runs and wins as president in 2016, there are fears that the DOJ cases against all of those implicated in the pork barrel scam will not be pursued as those being charged are his political allies. "Suddenly, meron kang naiisip na ma-undermine itong kaso na ito after 2016. Remember that until Ruby Tuason, yung incentive ng lahat ng whistleblowers, lahat ng state witness ay lumabas. At parang lumalabas, wala nang pipigil sa tuwid na daan," he said. "Ngayon, nagdadalawang-isip na tuloy ang mga ibang potential witnesses kung lalabas ba sila o hindi... Kung si Binay ang uupo, matutuloy ba ang mga kaso at magiging matigas pa ba ang DOJ at NBI [laban sa corruption]?" Cayetano said that now the pressure is on the Office of the Ombudsman and the DOJ not only to come up with more witnesses, to file the cases and make sure that they would be strong to the extent that whoever sits as president in 2016, they would not be dismissed. The senator noted that Binay had been very vocal against former president and now Pampanga Rep. Gloria Macapagal-Arroyo at the height of the public discussion of the corruption scandals she had been implicated in, but is now defending Enrile and Estrada. "The Vice President never bugged JPE and Senator Jinggoy to answer. Yet he is bugging the DOJ kung bakit ganun ang handling," he explained. Meanwhile, Binay cleared that the need for Tuason to testify is proof that the prosecution's case is weak. 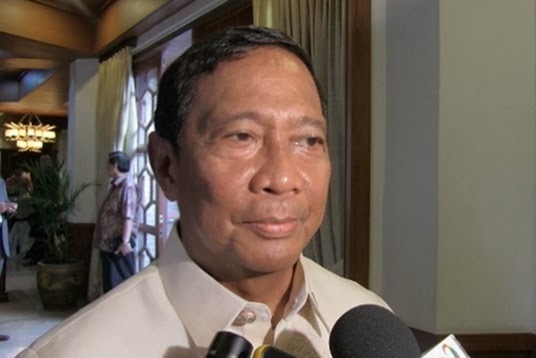 "No, I never said that," Binay said, after being asked about his previous interview describing Tuason's testimony a dud. "The case of the prosecution is weak kaya kailangan ng (that's why they need a) state witness," he said.